In the promenades in Leipzig Main Station, you can pursue your shopping fun as soon as you arrive by train: 142 shops are open every day until 10 p.m. from Monday to Saturday, and many of them also on Sunday. Another shopping paradise is not far away - the “Höfe am Brühl”, with a large range of offers and an unusual mix of architectural material. The fashion houses Peek & Cloppenburg and Breuninger can be found in the city center, with a wide selection of luxurious designer labels, as well as to department stores such as Karstadt and Galeria Kaufhof. Leipzig's original Krystallpalast, which first opened its doors in 1882, was one of Germany's largest entertainment venues at the end of the 19th century and featured international stars such as Josephine Baker and the Italian juggler Enrico Rastelli. Since 1994 the new Krystallpalast Variety Theatre has been continuing the work of its predecessor, which was destroyed during the Second World War. And once again, thrilling acrobatics, captivating music, hilarious comedy and great cuisine have come together to provide audiences with a variety experience of world renown. During the Bach Festival, Leipzig presents the multifaceted works of the baroque composer and highlights his close ties to the city. For more than 20 years, Johann Sebastian Bach was the cantor of St. Thomas Church in Leipzig. Today's Bach Festival sees internationally acclaimed musicians such as Masaaki Suzuki, Marcus Creed and Ton Koopman, together with Leipzig's famous St. Thomas choir and Gewandhaus Orchestra, honour the great composer at locations where he lived or worked. Every November, euro-scene in Leipzig brings experimental theatre and innovative dance to Saxony from all over Europe. For six days, this festival of contemporary European theatre illustrates the latest developments in dance and theatre, with approx. 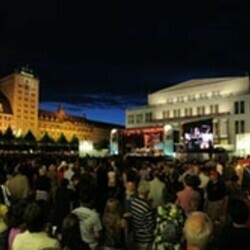 15 different guest plays totalling around 25 performances in various Leipzig venues. There's also a programme of discussions, workshops and films.